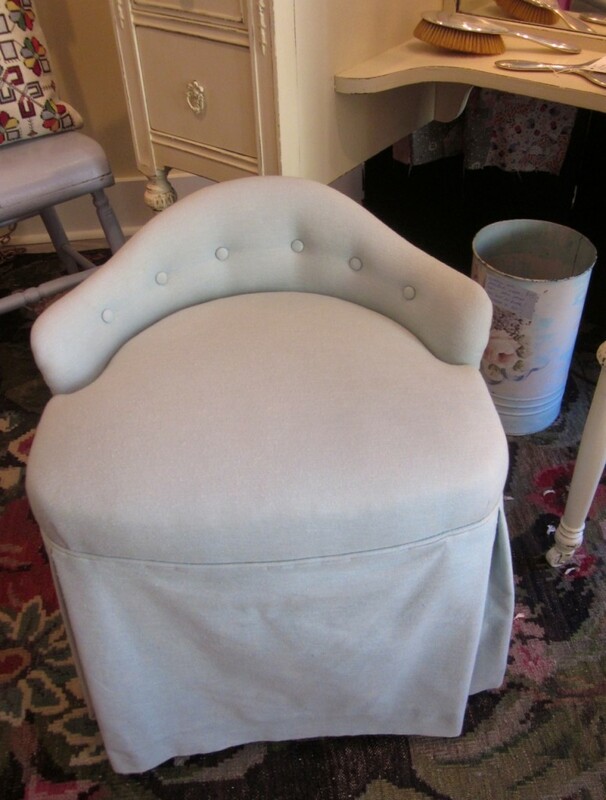 We have a very lovely pale blue vanity chair in the store this week. The chair was beautifully made by the Thornton-Smith Company of Toronto in 1940. Mabel Cawthra Adamson, who was the first president of the Society of Arts and Crafts in Canada in 1903, founded the Canadian franchise of the Thornton-Smith Compnay, a British interior design firm, in 1905. This company was a legendary influence on Toronto interiors. They sold custom furniture, fabrics, rugs and drapery. They decorated the Royal Alexander Theatre, parts of Massey Hall and even the Senate Chamber in Ottawa. We are pleased to be able to offer this delightful swivelling vanity chair with such an interesting history attached. « Getting your fireplace ready!